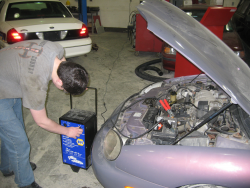 The Automotive Tech I program is comprised of classroom and lab experiences designed to develop skills and attitudes for a safe working environment. Students learn basic and complex engine fundamentals such as, but not limited to: safety, gasoline engine fundamentals, the cooling system, lubrication system, valve mechanisms, pistons, crankshaft and connecting rod assemblies, fuel systems, standard transmissions, emissions and emission control devices, wheel alignment, and clutches. Units on hardware and measuring, hand tools and equipment, and electrical/electronic systems are also covered.